Snowdrops and crocus flowers herald the spring. And if you look in between them, with luck, you’ll see a bright green creeping plant low to the ground with little white starry flowers: chickweed, a good friend of mine. I say she’s a star, because her botanical name – Stellaria media – means little stars. And because she really stars at helping us when we need to gently dissolve something or to cool off inflamed tissues. Chickweed not only effects physical health, she is a psychic healer too. She opens us up to cosmic energies and gives us the inner strength we need to handle those energies. Chickweed contains soapy substances, called saponins. Saponins, like soap, emulsify and increase the permeability of cellular membranes. When we consume chickweed those saponins increase our ability to absorb nutrients, especially minerals. They also dissolve and break down unwanted matter, including disease-causing bacteria, cysts, benign tumors, thickened mucus in the respiratory and digestive systems, and excess fat cells. 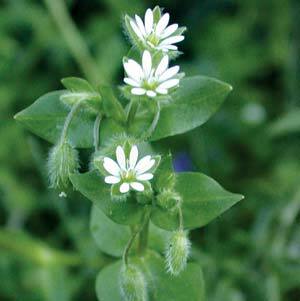 Chickweed’s ability to break cells open helps it get rid of bacterial infections when applied as a poultice. It is every mother’s favorite for dealing with children’s eye infections (pink eye). I crush a small handful of the fresh herb until it is juicy, then apply it directly to the troubled eye or infected wound, covering the chickweed with a small towel to keep it in place. I leave the poultice until the chickweed heats up, which indicates to me that bacteria are dying. Then I remove the poultice and throw the plant material away. It is critically important to use fresh chickweed for each application so bacteria are not reintroduced. Generally symptoms will at least start to go away after the first application, but using several more chickweed poultices, once or twice a day for several more days, will insure full healing. Our beautiful star is superb at dissolving cysts and benign tumors. She especially shines when it comes to getting rid of ovarian cysts. Since many doctors, frightened of ovarian cancer, are fast to suggest surgical remedies for ovarian cysts, having a safe and effective green ally can save us from major surgery. Using chickweed to dissolve a cyst or benign tumor is a slow process, and requires consistency. It also requires chickweed tincture made from fresh, not dried, plant material. You can buy the tincture already made. Or make you own: Fill any jar, large or small, with fresh chopped chickweed and 100 proof vodka. Wait six weeks and it’s ready to use. A dropperful of the tincture taken 2-3 times a day for 2-16 months is the usual course. Women with “hot” bladders – such as those interstitial cystitis, chronic cystitis, or a bladder irritated by childbirth or abdominal surgery – adore chickweed. She soothes and cools, removes bacteria, and strengthens the bladder wall. What a star! But don’t wait for a problem to get to know chickweed. She is delicious and ever so happy to jump into your salad bowl and share her star qualities with you. Chickweed is loaded with nutrition, being high in chlorophyll, minerals – especially calcium, magnesium, manganese, zinc, iron, phosphorus, and potassium – vitamins – especially C, A (from carotenes), and B factors such as folic acid, riboflavin, niacin, and thiamine. I’m going to grab my scissors and my basket and go outside and pick a bunch of chickweed and make this yummy spring salad: 4 cups fresh chickweed, 2 cups fresh watercress or miner’s lettuce, 1 cup fresh flowers, such as violets, and 2 tablespoons of finely-chopped wild chives. I dress it with olive oil, tamari, and whatever herbal vinegar strikes my fancy, or just plain apple cider vinegar. There’s lots more information on the little star lady chickweed in my book Healing Wise. It’s green, like chickweed, like the blessings the Earth offers us so freely. So, grab your scissors, and go harvest some chickweed for dinner tonight. You’ll make a new friend who can really help when times are tough.